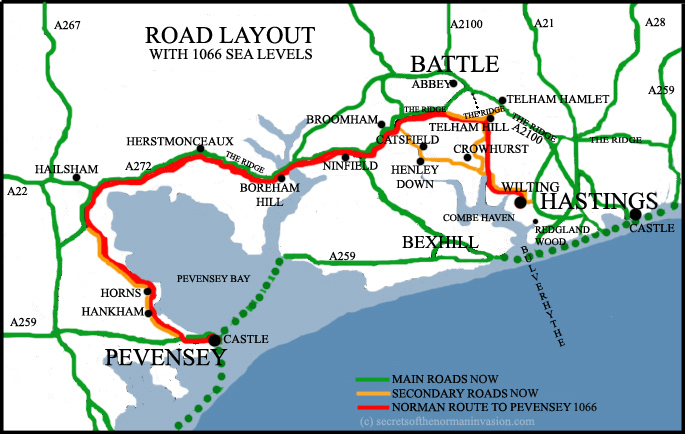 When invading England in 1066, William the Soon-To-Be-Conqueror didn't land at Hastings, he landed at Pevensey Bay. At the time it wasn't the low-lying featureless coastline we see today, it was a proper wiggly bay with inlets and everything. 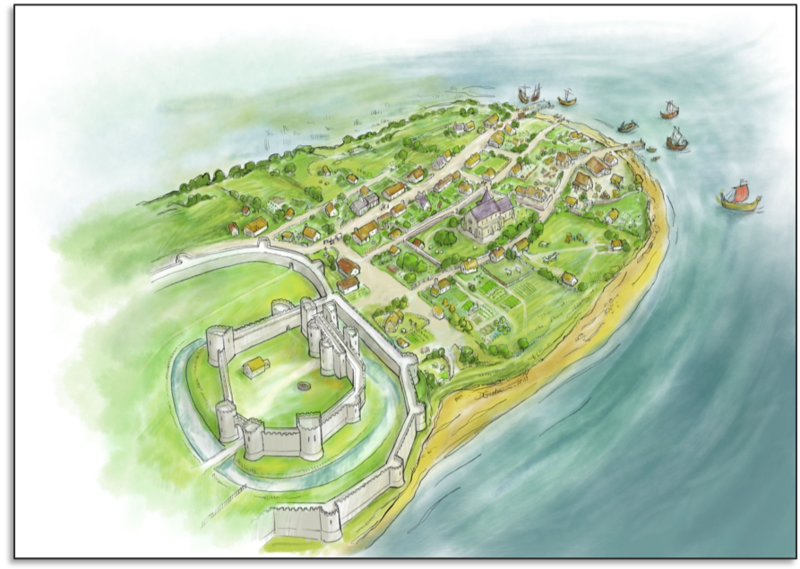 The remains of a Roman fort existed here on a small peninsula poking out from a larger peninsula, where William built a temporary fortification before heading off to whop the English. A stone keep was built inside the Roman walls, and later surrounded by another ring of fortifications for added protection. It's big, and it looks like a proper castle, even if it's no longer particularly close to the sea. 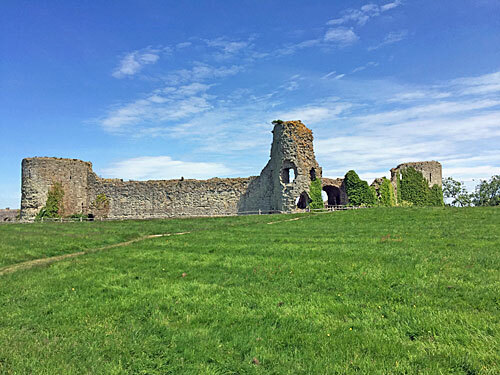 The outer bailey, which resembles a large meadow, is fully accessible and has a public footpath running through it. Only if you walk to the far side, and cross the moat/ditch, do you reach the inner bailey where English Heritage hold sway. The lady in the hut, with the guide books and free samples of strawberry wine, was marvellously informative about the back-history of the castle, possibly because she hadn't had anyone to chat to for a while, but more likely because she was good like that. You can either wander and look at the walls, or better, take an audio wand and listen to a full history of the place on the way round. It'd be easy to miss the steps by the gatehouse down to the dungeon, a proper miserable darkspace, currently with a flooded floor to add to the grim ambience. A so-called oubliette lurks on the other side, a far worse place to be chained up because it had no steps. 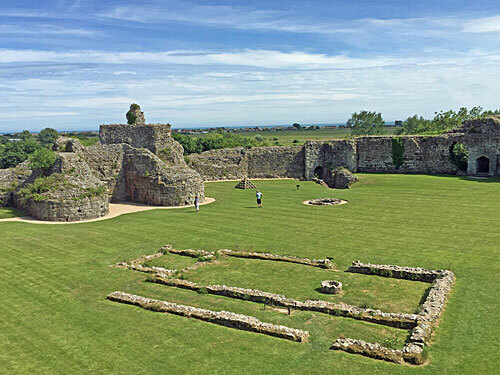 Harder to miss are the deep well in the middle, various piles of enormous stone cannonballs, and the Pevensey Gun engineered hereabouts in the reign of Elizabeth I in an attempt to see off the Spanish Armada. Stepping inside the main towers reveals another surprise - wooden floors installed when the castle was used to station US and Canadian troops during WW2. The south coast again risked being a point of invasion, so it was crucial to have soldiers keeping a watchful eye, just in case. That's why the remains of the Norman keep, long toppled, now have a pill box perched on top. The layers of history at Pevensey are legion... and you can find out more in a small exhibition inside the North Tower. Trot up to the top, via a newly-installed wooden staircase, to get the best view. The sea is now a mile away, along a strand lined with France-facing houses and Martello towers. The intervening marshes were drained after the river was silted up, in this case deliberately, so sheep now graze where once was sea, and the railway crosses what was originally the head of the bay. It's left the village of Pevensey stranded inland too, its former existence as a port on a small promontory almost impossible to discern. Pevensey's a charming little village, with an Early English Gothic church that's well worth popping inside. On the main street is an old court house and jail, which doubles up as a small museum in the summer months, but which alas wasn't open when I passed by. A tearoom and a couple of pubs survive, but the antique shop in the quaintest row of cottages recently faded away and is currently up for auction. All the everyday facilities are on the opposite side of the castle, in the village of Westham, so a stream of local residents can often be seen traipsing through the outer bailey between one and the other. Extra paragraph for readers who only appreciate paragraphs about public transport: Pevensey has two railway stations. 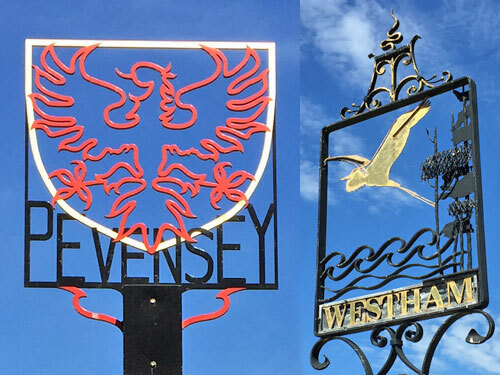 One is Pevensey and Westham, which is deep in Westham, and has all the trains. 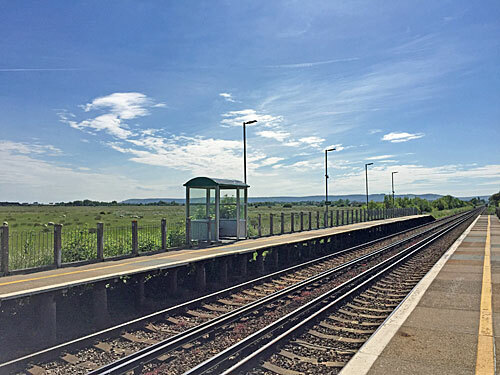 The other is Pevensey Bay, a couple of platforms on the road to the coast, which is a tumbleweed backwater with barely any service at all. It sees five trains towards Hastings every weekday, and four towards Eastbourne, and everything else rushes straight through. Not for nothing is Pevensey Bay one of the dozen least used stations in London and the South East. I timed my trip home carefully, being careful not to get trapped on the wrong side of the level crossing, and spent some time watching the sheep beyond the far fence. I hid from the sun inside the shelter, where I was intrigued to see a sticker "Presented to Pevensey Bay for Five Star Achievement in the Experience Quality Improvement Process 2010", which is good going for an unstaffed halt. I realised the train was definitely going to stop when it reached one end of the platform before the level crossing barriers had descended fully at the other. And I was the sole passenger taking advantage as we pulled away across the marshes, where the Normans landed, right on time.